John Murray came to Burke in 2002 for stroke rehabilitation. 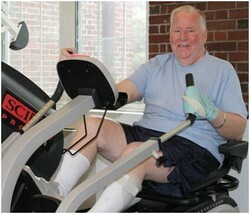 After rehab was over, his therapists recommended that he join the Fit for Life Program at Burke' Adult Fitness Center. The Fit for Life program is a group class where participants perform a variety of strengthening, flexibility, endurance and balance exercises to further recovery after a stroke. The program is also offered to those who have COPD and Parkinson's disease.